Over the years, conferencing solution providers have become better at creating natural-sounding communication. This has been accomplished through greater quality microphones, improved processing, and specific features like beam-forming microphones or tracking cameras. While these improvements were welcome, they fell short of the ultimate goal. Those solutions were all oriented towards rooms and meetings in which everyone sits around a single table and faces in the same direction – usually towards the display. Improving that static scenario did not really open the possibility of better remote conferencing – or the creation of the truly collaborative space where participants are not static. Until now. These issues – and new breakthrough solutions – are the focus of a white paper just being made available for download here. Toward more dynamic meeting rooms and advanced audio conferencing. In the last two decades, the time people spend working collaboratively has grown by 50%. And 43% of employed Americans spend at least some time working remotely. As the number of remote workers rapidly expands, so does the need for remote collaboration. Yet, despite the changes to the ways we work, audio conferencing technology has remained relatively the same. But a revolution in collaboration is now taking place across organizations. The latest in audio conferencing technology lets you be heard from anywhere in the room for a more natural remote collaboration experience. How does this new technology take a new approach to get to more collaborative solutions? Watch the video clip below from the August 2017 AV/IT Summit that explains how the remote collaboration experience can operate and feel more natural than ever. Delivering natural collaboration that is as free as face-to-face interaction, but that also includes the contribution of remote assets, is a powerful opportunity to help any organization reach its goals. Is there a solution that solves the issues of effective conferencing in increasingly collaborative meeting spaces? There is now. 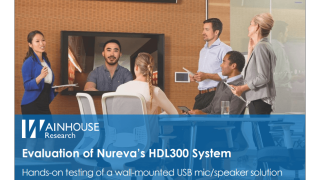 The Nureva™ HDL300 audio conferencing system with Microphone Mist™ technology is a self-contained system for natural collaboration. The HDL300 marks a very large jump forward in audio conferencing technology. It provides audio that represents what people would naturally hear if they were in the room. For rooms up to 20 ft. x 20 ft. (6 m x 6 m), the HDL300 soundbar is equipped with 12 individual transducers that create a virtual matrix of microphones. Proprietary technology and processing creates 8,192 virtual microphones in a grid covering the entire room. No corner or edge of the room is left without coverage, and those speaking don’t even need to face the soundbar to be heard clearly. The internal real-time hardware processing operates 15-times faster than conventional systems and focuses on the loudest voice in the room. No additional clean-up processing is needed. The soundbar also hosts two stereo loudspeaker drivers with internal audio amplification and comes in a sleek black or white design. The HDL300 system also includes a breakout box for integration with UC&C solutions. The breakout box has a single CAT-5 connection that transports audio to and from the soundbar as well as providing PoE power. The breakout box also includes a single USB connection to any computer device that is running the soft codec client of choice. In the case of hard codec conferencing or to support any additional audio devices that may be necessary, the breakout box provides analog input and output connections on standard 3.5mm jacks. How does this new solution work? This video explains how this simple-to-install audio solution makes your remote collaboration experience feel more natural than ever. You can read the in-depth report from Wainhouse here. Will the solution allow participants to move around in the room and still work perfectly? Can the solution handle a larger room as well as a small huddle space? How can the audio solution easily connect to the preferred audio codec? What are the keys to finding high-quality solutions that can easily be deployed to as many rooms as possible? Can the end client deploy the type of solution with their own IT or in-house AV staff? Can AV integrators deploy many rooms based on a self-contained system very quickly and therefore address a large number of rooms in a very short period of time? To see the story of how Nureva answered all those questions and developed the solution, click here. All these issues – and new breakthrough solutions – are the focus of a major white paper just being made available for download here.